Your hand wraps naturally around the contoured side stick control. The nimble MS-1 is responding to every nuance of your touch. You've left your FAA Medical at home. Or you don’t have one. This is an LSA – you don’t need it. A warm smile spreads over your face. 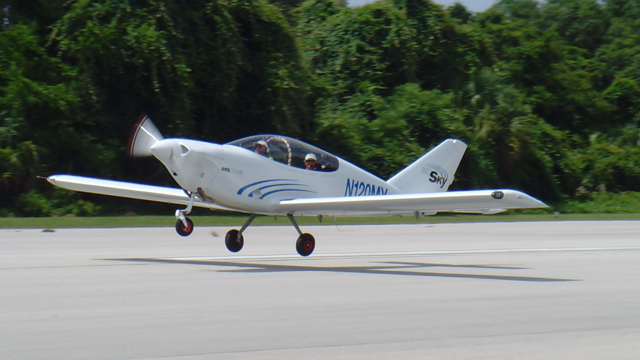 Just when you thought the thrill of flying a true sport airplane was out of reach, you discovered the ultimate LSA. The marvelous MS-1. Welcome to the MySky adventure. * MySky ONE’s bubble canopy absorbs 95% of all UV-A and UV-B radiation. On the ground you can taxi with the canopy halfway open, in the air powerful fresh air ventilation keeps you comfortable. **it could be 100LL or automobile gas.